I spliced the four sections of my updated Requiem I originally wrote some time ago into one Box file for here. The only synth on this is the short slice and dice spot on The Darkness. New, hopefully higher quality individual files below! Last edited by fastlanephil on Tue Mar 19, 2019 6:42 pm, edited 1 time in total. All of these compositions are skillfully done. I am not sure if the light and folky "Going Home" fits with the other material which is dark and demanding. 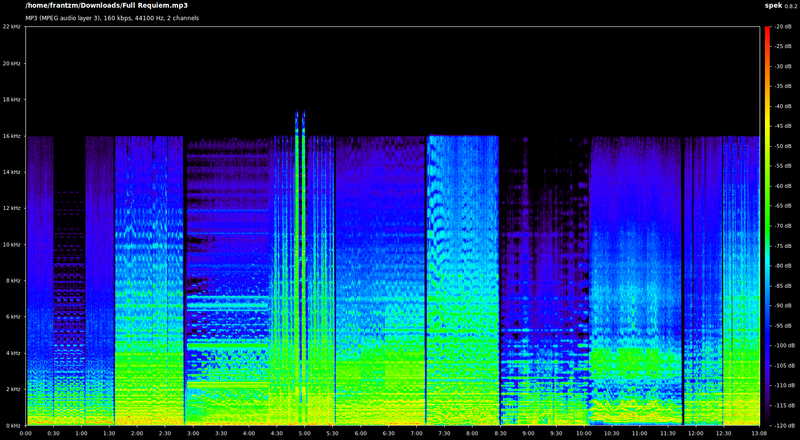 The mix has all sound above 16kHz removed which sounds unpleasant and lo-fi to me. (You can open the image in a new tab to see it more clearly.) I think you may be regularly doing this kind of low passing to your mixes but it's hard to check when you don't provide a downloadable MP3. Refreshing Classical music I think. The theme sounds familiar to me. Nicely done. the space was nice and big, although lacking in high end detail as Frantz noted. showed a weird peak way down in the 30hz! Last edited by layzer on Tue Mar 19, 2019 5:43 pm, edited 1 time in total. I imagine it’s probably lacking some fidelity because I lazily downloaded them individually as MP3s off of another site and Logic then saved it as an aif and then I resaved it as an MP3. I promise not do that again. Yes, the first part is quite a contrast to the other three parts. It’s like going to church and singing hymns together about one’s future heavenly reward and such. A community of support that I experienced growing up. Then the listener is sort of thrown to the wolves starting with the second part. The fear of death, the hope of one’s redemption in some way and finally what to make of it all. A simplification. Yes, the first part borrowed a little from the old spiritual Swing Low, Sweet Chariot. I found out how to mess up the fidelity of a sound file didn’t I. *refer to my response to Franz. OK. Here's the individual parts of Requiem. These should have better fidelity. If you are going to splice audio together to create a master, you should be working with an uncompressed format like WAVs. When creating MP3s, I suggest going for the highest quality MP3 possible such as 320 kbps, 48kHz. You are going to lose high frequencies with a bit rate of only 160 kbps.